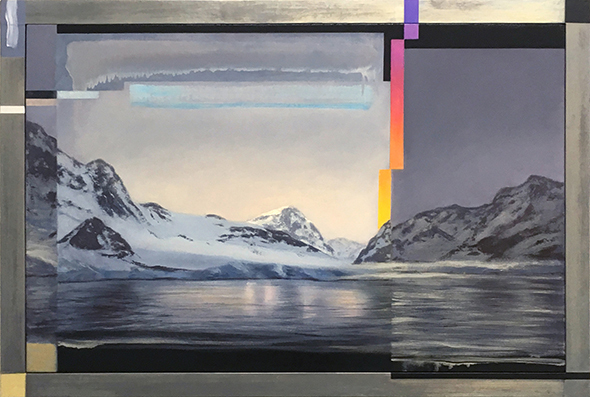 Adam Straus, Glitch at the Edge of Antarctica, 2016. Oil on canvas in lead with oil and brass leaf, 41 x 61 x 2 inches. The work of Adam Straus, spanning a three and a half decade career, will be on view at Nohra Haime Gallery and Adelson Galleries from November 23, 2016 through January 14, 2017. The two exhibitions at 730 Fifth Avenue will showcase paintings, works on paper, sculpture, and photography. Straus is known for his majestic and luminous depictions of the sublime, which are often saturated with a deep concern about social and environmental issues. His penetrating dark humor can transport the viewer to post-apocalyptic worlds and often offers a wry observation on how humans have altered the natural landscape. The exhibitions coincide with the publication of a new monograph (Gli Ori, Italy, November 2016). An opening reception will be held on Tuesday, November 22, from 6 to 8pm. With more than 40 works, the exhibition at Nohra Haime Gallery will survey Straus’s oeuvre from 1979 to 2016. While the focus will be on paintings and works on paper, Straus’s little-known photography and sculpture from the early 1980s will provide context for his later transition to painting. A number of the works are from private collections and will be on public view for the first time. At Adelson Galleries, the exhibition will focus on 16 paintings from 2011 to 2016, many of which, in a witty and irreverent manner, refer to how technology alters our view of nature.